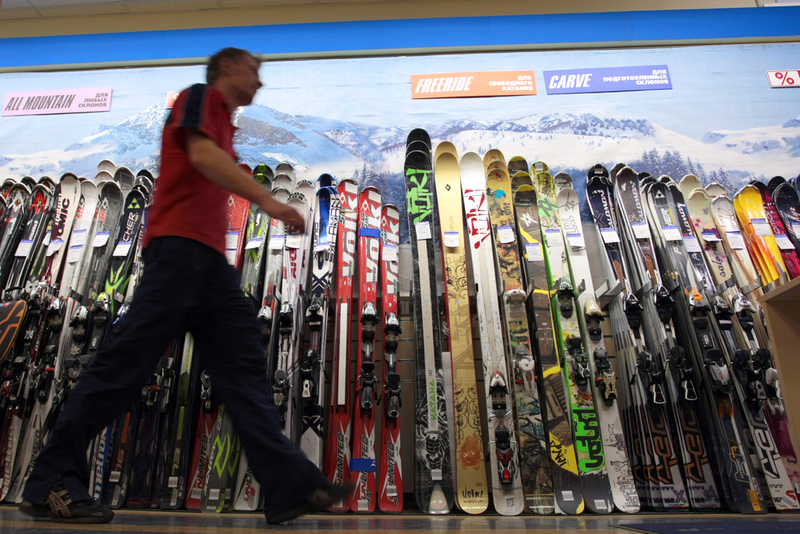 Skis on sale in a SportMaster chain store. Russian apparel makers such as Sportmaster, SELA and Concept Group are eyeing the lucrative markets of China, India and ASEAN. Once highly dependent on imports, the Russian clothing industry has transformed dramatically over the last few years. The weak ruble has made imported clothes, shoes and accessories less affordable for Russian consumers, giving more space in the market for local manufacturers, especially in the lower priced segment. Amidst overall stagnation in the Russian clothing and footwear market, domestic apparel brands have adopted anti-crisis strategies by reducing prices or relocating manufacturing facilities from China and Southeast Asian countries to Russia, as the labor cost has significantly fallen in the country. Some of the largest players in the industry have continued their long-term plans for global expansion, although the focus has shifted. As Western markets pose certain challenges due to the economic and political tensions, Russian clothing brands have turned to Asia. Countries like China, Bangladesh, India, Pakistan, Sri Lanka and Vietnam are generally considered global apparel manufacturing hubs. However, many of these countries have emerged as fast growing consumer markets, offering huge opportunities for foreign apparel brands. The Chinese market will account for almost one-third of regional demand for clothing followed by Hong Kong, Japan, South Korea, Indonesia, India and other countries. “The Asian market at large is extremely heterogeneous both from the point of view of volumes of national markets, and from the point of view of the peculiarities of the purchasing power of the population,” Timur Nigmatullin, financial analyst from FINAM Group suggests says. Over the last few years, several Russian apparel brands have set up shop in Asian countries. Sportmaster, Russia’s largest retailer of sportswear and fitness gear started its Asian expansion several years back. While announcing these plans back in 2013, Sergey Agibalov, Sportmaster Group’s business manager noted that company had considered China as a potential market due to its geographic proximity to Siberia and the Russian Far East, and also because the company had been placing orders at Chinese factories. Despite a sharp decline in the home market in 2014 and 2015, the company managed to open 12 stores in China under the Sportmaster brand and 19 stores under the O’STIN brand (casual wear of middle-level price category). According to a source in the Sportmaster Group, China remains the most attractive market for the company in Asia. “It is a large and growing market where we have to compete with global brands,” he says, adding that there are very few market entry barriers in China when compared to other Asian markets. “Sportmaster has several dozen retail stores in China now. Clearly, their expansion strategy can be considered successful, and in 5 years the company’s Chinese store chain could become larger than the one in Russia,” Nigmatullin says. Russia’s Carlo Pazolini Group, which has been manufacturing luxury shoes and accessories since 1991, has shifted up to 70 per cent of its manufacturing operations from Europe to China. It also operates its own boutique in Beijing and has announced plans to open more retail stores in the country. The company’s spokesperson refused to comment on further expansion in other Asian markets. In January 2016, Vladimir Yevtushenkov, Chairman of AFK Sistema told the Russia24 TV channel that the company’s fashion retail asset, Concept Group, launched a partnership with India’s Tata Group to sell Russian-made clothes through Tata’s new e-commerce venture, TataCliq. The platform was officially launched in India in the end of March, and the Russian-made Infinity Lingerie brand is already represented there. According to a source in AFK Sistema, the conglomerate does not have a clear strategy for Asian expansion of its retail assets, although there is a definite interest in these markets. The launch of Concept Group’s partnership in India is considered a pilot project, and based on its success AFK would decide on further expansion of this and other assets, he added. Sistema acquired 40 per cent stake in Concept Group in 2014. A foray into the Indian market turned successful for another Russian apparel brand, SELA. The company partnered with two e-commerce platforms, Amazon and Myntra, for selling its collections on-line. SELA does not differentiate between brand positioning in Russia and in India, although when it comes to pricing, the brand falls into different price segments. While in Russia SELA operates in the lower-medium priced segment, in India it is placed in the mid-market category. Timur Nigmatullin from FINAM believes that the current Asian expansion of Russian brands can be considered as the beginning of a trend that was predicted by experts a long time ago. “We are likely to see more Russian companies entering Asian markets in the near future. Their main advantages in these markets would be established relations with local manufacturers and good corporate management practices,” he adds. Anna Lebsack-Kleimans, Chief Executive of Fashion Consulting Group doubts whether Russian clothing brands have any significant advantages in Asian markets. Lebsack-Kleimans says local brands have very loyal customers in most Asian markets. She adds that Russian brands can win over Asian consumers by offering some outstanding concepts, original ‘European’ designs, or a unique retail format. Russian designer Gosha Rubchinsky is probably one such example. Spotted by Comme des Garçons a few years ago, Rubchinsky’s name and story went viral from Moscow and London to Milan and Paris to Tokyo and Seoul. Gosha Rubchinskiy streetwear, which is inspired by 1990s Russia subcultures, is also available in various retail outlets in Indonesia, Philippines, Hong Kong, Singapore and Taiwan. Read more: Why is Russia borrowing money on the foreign markets?